When you need a smoking style slipper loafer that has the quality and style that the night life requests, you can never go wrong with Giorgio Brutini. 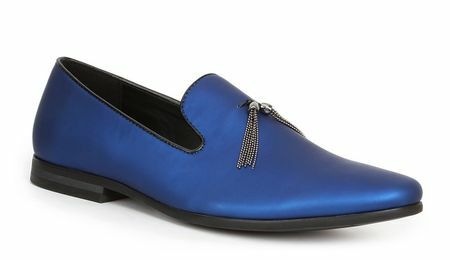 These shiny blue pearl slipper loafer shoes are the perfect shoes to wear for the red carpet or to the club on Club night. Perfecting your style should never be an arduous endeavor because these slipper style loafers are "the shoe" to wear for men.